We deliver the SAP Cloud Platform SDK for iOS as binary Swift frameworks. Unfortunately, up till today Swift frameworks are not binary compatible across Swift versions (https://swift.org/abi-stability/). Within the same major Swift version, at least the source code hugely remains compatible, i.e. code that is compiling with Swift 3.0.1 should also compile with 3.1. Swift versions are tightly coupled to Xcode versions. E.g. Xcode 8.2 used the Swift 3.0.1 compiler, Xcode 8.3.x uses the Swift 3.1 compiler. Xcode 9 uses the Swift 4 compiler, but also supports a Swift 3.2 mode to ease the transition from Xcode 8. To make things more confusing, binaries compiled with the same Xcode 9 and Swift compiler do work across Swift 3.2 and Swift 4 (think of Swift 3.2 as a compatibility mode in Swift 4, not really a Swift 3.x language version). What this means for consumers of the SDK is that the Xcode version you’re using as a developer needs to match the Xcode version that we have used to produce the SDK. This is why we’re mentioning the Xcode version with each available download of the SDK. 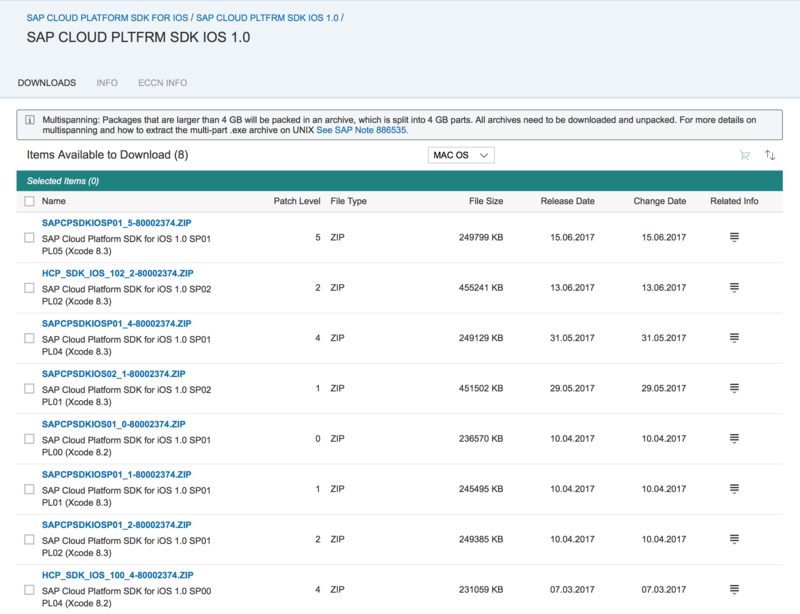 The versioning of the SDK itself follows SAP conventions; we have major version, service packs, and patches. It is important to realize, that there is no one-to-one relationship between Xcode version and iOS version. Even though each new iOS version comes with a new Xcode version that you need to use to leverage the latest iOS SDK, you can also build for older iOS version using the latest Xcode. E.g., Apple will release Xcode 9 with iOS 11 – and for building iOS 11 apps you do need Xcode 9. But you can also continue to build iOS 10 apps with Xcode 9. Along the same lines, the new SDK major version that we will release closely around the release of a new Xcode/iOS will support the latest iOS and also leverage new iOS features, but we do continue to also support the previous iOS version as well. In addition, we will also recompile the previous SDK version so it will run (only!) with the latest Xcode. This previous SDK version only uses features of the previous iOS SDK, obviously, but you’ll then need to use the latest Xcode to consume it. Hi! Thanks A lot for article. By the way (may be it’s an offtop a little bit) are there any documentation or prerequisites (minimal configuration) for device recommendations for iphone ipad using applications with IOS SDK 2? Sergey – any device running the required iOS version will do for plain SDK for iOS use; beyond that I presume it’ll highly depend on your app and what type of things you’re doing there, e.g. AR will require a 6s or newer. Are there any plans for supporting Xcode 10.0 beta? As it seems like, there is no SDK version available which allows us testing new iOS 12 features right now without removing everything related to SAP. This is pretty annoying. Yes Yannik, we understand the need and are working on it; we anyways need to make sure our stuff will work fine on Xcode 10 later in September. Keep an eye on the download page, we’ll publish as soon as we’re ready.